The Antonine Wall is an ancient and historical monument originating as imperial Rome’s one-­‐‑time northwest frontier in modern Scotland. 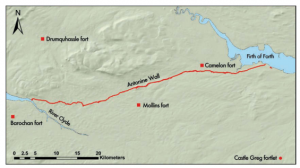 The Antonine Wall is first, and perhaps foremost, an ancient and historical monument originating as imperial Rome’s one-­‐‑time northwest frontier in modern Scotland. It was inscribed in 2008 as the third component of the “Frontiers of the Roman Empire” UNESCO WHS, joining Hadrian’s Wall (inscribed in 1987) and the German Limes (inscribed in 2005). It is, thus, internationally recognised as a frontier and Roman military monument (UNESCO 2009). While its unique qualities are independently considered and the Wall is viewed as an important monument of Roman Britain—and Roman Scotland in particular—it is perhaps because of the Wall’s role as just one part of an empire-­‐‑wide frontier system that has led it to attain WHS status. This initial historical summary seeks to place the Wall within the context of Roman imperial expansion and the second century establishment of frontier lines across much of the empire; the focus here will be this Roman period context. This context includes all documented Roman incursions into Britain, including the early and limited campaigns of Julius Caesar; while it is certain that Caesar never reached Scotland, his limited activities in Britain mark an important milestone that paved the way for later invasion and expansion. Furthermore, despite Caesar’s lack of authentic connections to the territory now called Scotland, he nevertheless figured in the narratives and speculations of medieval and early modern Scottish historians and is especially relevant here. 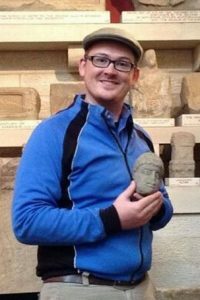 Following this overview of Rome’s invasions of and expansions in Britain, the summary concludes with a brief overview of post-­‐‑Roman activities, including non-­‐‑Roman features and the Wall’s rediscovery and research in the modern era. Roman forces first arrived in Britain in the first century BC. The first documented invasion, led by Julius Caesar (Caes. Gal. 4.20–37), occurred late in the summer of 55 BC. The invasion was part of Caesar’s Gallic wars and, according to his commentaries, was designed to gain information on the Britons, some of whom had been providing aid to his enemies in Gaul (ibid. 4.20). With a fleet of eighty ships carrying two legions, Caesar attempted to land at modern Dover but, finding the location unsuitable due to the defensive potential of the cliffs, landed at an unknown location about seven miles away (ibid. 4.23). Battle ensued and, although the Romans were confused and disadvantaged by the unusual experience of a marine invasion, Caesar’s troops secured victory within four days (ibid. 4.28). When the Britons saw that the Romans were losing ships to storm and tidal damage and had no food stores, they reneged on their peace treaty and fighting resumed (ibid.4.30). A second peace was finally agreed, with the Britons promising to send hostages, and Caesar’s remaining fleet returned to Gaul just before the autumnal equinox (ibid. 4.36). 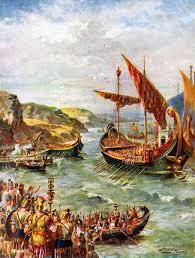 The following summer Caesar invaded again, bringing five legions and about 2,000 cavalry (Caes. Gal. 5.2–24). This time, rather than remain near the initial landing site, the Romans immediately marched inland some twelve miles (ibid. 5.9). Eventually, Caesar led another march inland, all the way to the river Thames, where battle ensued with the Britons fighting under the command of Cassivellaunus (ibid.5.18–19). After receiving the surrender and support of several nearby tribes (the Trinobantes, Cenimagni, Segontiaci, Ancalites, Bibroci, and Cassi), Caesar finally marched on Cassivellaunus’ capital (ibid. 5.21). Cassivellaunus surrendered, and Caesar returned to Gaul with a great number of captives, just after the equinox (ibid. 5.23). It is important to remember that the account of Caesar’s two invasions is written by Julius Caesar himself, though presented in a relatively objective-sounding third-­‐‑person narrative. Caesar’s second British campaign is corroborated by references in contemporary letters of Cicero (e.g. Cic. Att. 4.15, 4.17, 4.18; Cic. Q. fr. 2.15, 3.1), but both of Caesar’s invasions remain unconfirmed by clearly datable archaeological evidence (Darvill 1987: 166). Despite the lack of archaeological corroboration, Caesar’s two invasions of Britain should be accepted as fact, though the account needs to be understood as part of a work designed to provide personal and political benefits to Caesar himself (Webster 1993: 34–35). Thus, while Caesar seemingly does not hesitate to point out problems with Roman preparedness and tactics, it is reasonable to assume that the account was carefully crafted to paint him in the best possible light (ibid.). While these invasions did not lead to direct Roman administration or the permanent garrisoning of troops in Britain, they opened the island to cultural, diplomatic, and economic exchange, particularly in southeastern Britain (Creighton 2000: 55–79; Millett 1990: 21, 40). They took place during the waning years of the Republic, while Rome was expanding and solidifying its conquest of western Europe, and should be seen as attempts to promote the reputation and wealth of Julius Caesar as much as campaigns intended for the benefit of Rome. Following these activities, it would be almost a century before the Roman military returned to Britain. It was not until after the AD 43 invasion under the emperor Claudius that we can properly refer to a “Roman Britain.” This invasion came after a series of aborted plans, including three by Augustus between c. 34–25 BC (Dio Hist. Rom. 49.38, 53.22, 53.25) and one by Caligula in AD 40 (ibid. 59.25; Suet. Cal. 44–46). Our primary source for the events of the AD 43 invasion is Cassius Dio (Hist. Rom. 60.19–22). The original force was led by Aulus Platius for the purpose of aiding Berikos (probably Verika), an exiled leader of one of the local tribes, and probably a client of Rome (ibid. 60.19). After the initial landing, and Platius’ defeat of Caratacus and Togodumnus, Platius sent for Claudius, who arrived in Britain to participate in the capture of Camulodunum (modern Colchester, Essex), the capital of Cunobelinus of the Catuvellauni. After Camulodunum was taken, the emperor returned to Rome to celebrate a triumph, leaving Platius in command (ibid. 60.21). While the emperor’s personal stay in Britain was limited to only sixteen days (ibid. 60.23), with territorial gains seemingly similar to those achieved in Caesar’s 54 BC invasion, a key difference was the decision to keep troops on the island. From this decision, and the activities of the following years, it seems reasonable to conclude that Claudius and his generals planned nothing short of a complete conquest of the island (Millett 1990: 42). This would prove to be a difficult—and ultimately unattainable—task. The Romans first reached the territories of present-­‐‑day Scotland in the Flavian period (AD 69–96). Our primary source in this period is the biography of the Roman general and governor Gnaeus Julius Agricola (specifically Tac. Agr. 8–40) penned by his son-­‐‑in-­‐‑law Publius Cornelius Tacitus. While it is commonly accepted that Agricola (governor of Britain from 77/8–83/4) was responsible for Rome’s first conquest of territories in what is now Scotland, there is some (debatable) evidence that this may have actually taken place during the earlier governorships of Marcus Vettius Bolanus (governor from 68/9–71), Quintus Petillius Cerialis (governor from 71–73/4), or Sextus Julius Frontinus (governor from 73/4–77/8) (Breeze 2006c: 33–34; Shotter 2009). Tacitus’ Agricola, however, along with the bulk of archaeological dating evidence, suggests that even if the Romans were present in Scotland before Agricola’s governorship, his campaigns have left a more indelible mark on the landscape, and certainly on historical accounts. While arguments have been made for pre-­‐‑Agricolan forts in the north (e.g.Hanson 1991: 61–68, Shotter 2009; Wooliscroft and Hoffman 2006: 175–90), the northernmost certain identification is at Carlisle, where dendrochonological dates of AD 72/3 have been given (Caruana 1992: 104–6; 1997: 40–41). Of Agricola’s own campaigns, Tacitus informs us of seven individual seasons, each occurring in a separate year. The first season, with Agricola arriving in mid-­‐‑summer AD 77/8, was focused on crushing a revolt of the Ordovices in modern Wales (Tac. Agr. 18). The following year, Agricola’s attentions turned north, conquering several unnamed previously independent states and establishing forts and garrisons (ibid. 20). The third season was one of rapid expansion northward, with Agricola reaching the river Tay and building more forts (ibid. 22). In Agricola’s fourth season, he focused on securing the territories already gained, building a line of forts along the Forth-­‐‑Clyde isthmus (ibid. 23). Undoubtedly, these forts were also linked via newly constructed Roman roads and, if—as it seems likely—the previous year’s advance had been primarily limited to the east, supplied from Corbridge, this fourth season also saw some additional campaigning in the west of southern Scotland (Hanson and Maxwell 1983: 37). Figure 1.1: Known Agricolan garrisons on the Forth-­‐‑Clyde isthmus. Of the Forth-­‐‑Clyde fort line established at this time (Fig. 1.1), only those at Camelon and Mollins have been firmly identified, while it is possible that Agricolan forts were also at Mumrills, Castlecary, and Cadder; these may have been further supported by known Agricolan forts at Elginhaugh and Barochan Hill (ibid. p. 39). Agricola’s fifth season is unclear: Tacitus tells us that he made a sea passage, conquering previously independent peoples and lining his troops in the part of Britain that faces Ireland, possibly intending invasion of that island (Tac. Agr. 24). As Ireland was never invaded, and the context of this passage is entirely circumscribed by mention of the island, it is likely that this season was focused in the west, and that the sea passage was probably movement across the Solway or Clyde estuaries; the peoples conquered in this year may have been remnants in the far west of southern Scotland, Galloway, that had not been reached in the previous four years, or less probably, some of those located north of the Clyde in the western Highlands (Hanson and Maxwell 1983: 40–41). For the sixth season, Agricola turned his sights to the lands north of the Forth, using land and naval forces to secure control over the territories (Tac. Agr. 25–28). The fighting was intense and, in one night-­‐‑time attack, the enemy came devastatingly close to defeating the Ninth Legion at their camp, before Agricola arrived with reinforcements and chased the enemy into the forests and marshes (ibid. 26). The seventh season, AD 83/4, saw the culmination of Agricola’s northern campaign and the end of his governorship. 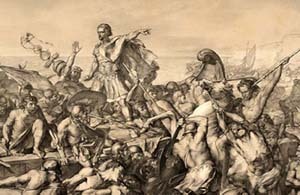 Again, using a combination of land and naval units—including both Romans and reinforcements of loyal Britons—he advanced and met a united enemy at Mons Graupius, where, while the enemy had been spurred on by a valiant (and most probably invented by Tacitus!) speech from one of their leaders Calgacus, the Romans were victorious (ibid. 29–38). The outcome of this battle was the defeat and dispersal of those who had stood against Agricola’s forces, and the chance for the Romans to continue work on securing their place in northern Britain; though the entire island had not been subjugated, for a time the threat of impending attack had been put down. Agricola himself was not able to enjoy the victory for long, and was recalled to Rome. Along with all the forts constructed during this seven-­‐‑year campaign, Agricola’s army also left behind dozens of temporary marching camps, now identifiable through earthwork remains or as crop-­‐‑marks (Jones 2011). Following Agricola’s recall, the Romans appear to have begun withdrawing from Scotland, though this was not immediate. In fact, there is substantial evidence to indicate that the Romans intended to stay on a permanent basis: a line of forts had been built along the Gask Ridge, Perthshire, probably by Agricola to protect the line of supplies for his campaign, and these were not abandoned with Agricola’s recall. Near these, was the legionary fortress at Inchtuthil, probably constructed by Agricola’s successor over two years, AD 85–86; further, as Tacitus does not mention fort building during Agricola’s sixth and seventh seasons, and as construction of forts was usually delayed until victory was secured in a particular area, it seems likely that no forts were built to the north of the Tay until after the victory of Mons Graupius: thus, the forts of Cargill, Cardean, and Stracathro are likely post-­‐‑Agricolan or were began just before his recall to Rome (Breeze 2006c: 55–57; see also Hanson and Maxwell 1983: 42). The late Flavian occupation of northern Scotland was short-­‐‑lived. The fortress at Inchtuthil was never completed and, while northern forts have produced a fair number of coins dated AD 86, no coins from 87 have been found, despite their relative abundance elsewhere. It is, thus, reasonable to conclude that the Flavian withdrawal began in 86/7, before the coins of 87 had the opportunity to arrive (Wooliscroft 2009: 35). Based on dating of ceramic and numismatic evidence, all Flavian forts north of Newstead were abandoned by AD 90 (Hartley 1972: 13–14). By AD 105, “even the tenuous grip on the Lowlands had gone” (ibid. p. 15) and the Romans appear to have fallen back to the Tyne-­‐‑Solway line, where the next major development would begin. By the early second century AD, Roman Britain appears to have had a northern limit centred on the Tyne-­‐‑Solway isthmus. The first emperor in this century was Trajan (reigned AD 98–117), who may have established the so-­‐‑called “Stanegate” frontier system: a line of forts between the Flavian bases at Corbridge (Roman Coria or Corstopotim) and Carlisle (Roman Luguvaliam). Additional forts, probably constructed early in the second century, were Newbrough, Chesterholm (Roman Vindolanda), Haltwhistle Burn, Carvoran (Roman Magnis), Throp, Nether Denton, and Brampton Old Church. Along with these forts, there may have been several watch-­‐‑towers in this period (Birley 1961: 136–50). This system loosely formed the basis for the most famous of Britain’s Roman monuments, Hadrian’s Wall (Symonds and Mason 2009: 10–33). The emperor Hadrian (reigned AD 117–38) visited Britain in AD 122 and, according to one of his biographers, he “put many things to right and was the first to build a wall, 80 miles long from sea to sea, to divide the barbarians from the Romans” (SHA Had. 11.2). This Wall (Fig. 1.2) largely followed the Stanegate line and stretched from Wallsend on the River Tyne to Bowness on the Solway Firth. Construction probably began in AD 122, and appears to have undergone several changes in plan. Originally, the Wall was to be constructed of stone from Wallsend to the river Irthing, and of turf from there to Bowness, with a regular interval of gates every Roman mile (1.6km), with two towers or turrets located between each gate; no forts were placed on the Wall at this time (Breeze 2006b: 50–51). The plan changed with the addition of forts along the Wall itself, replacement of the turf sector in stone, reduction of the Wall’s width for unfinished sections, and the addition of the massive “vallum” earthwork located to the south of the Wall (ibid.). Figure 1.2: Map of Hadrian’s Wall (Courtesy of David Breeze). 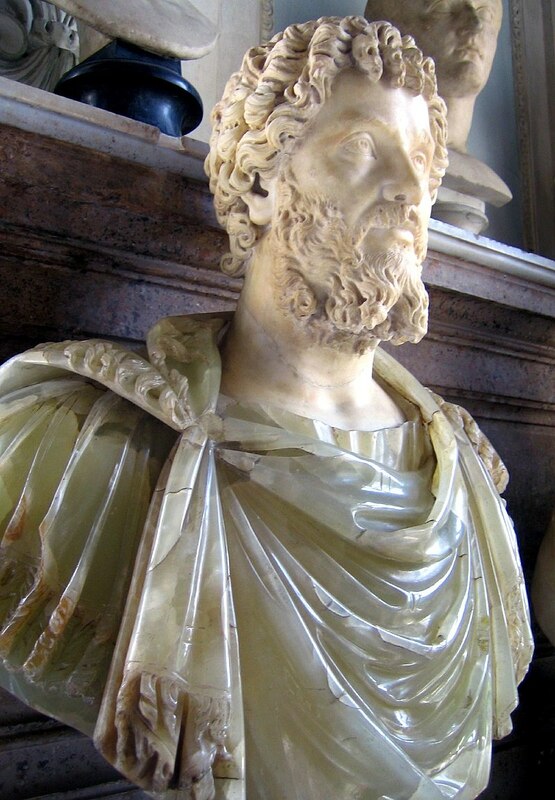 On Hadrian’s death, in AD 138, Antoninus Pius (reigned AD 138–61) succeeded to the throne. A wealthy noble with a good record, he nevertheless lacked military experience. For this reason it has been suggested that, while Hadrian may have chosen him as successor because “he was clearly a man of peace” that would almost certainly follow Hadrian’s own non-­‐‑expansionist policies (Breeze 2006a: 3), Antoninus may have required military credentials to strengthen his new imperial powers, and Britain was chosen as the vehicle by which he could increase his prestige with a military triumph (ibid. pp. 13–14). The invasion took place in AD 139/42, and was commemorated by coins of AD 143 (RIC 113, 719, 732, 743, 745), at which time the emperor was proclaimed Imperator for the victory. The result of this invasion to the north of Hadrian’s Wall, and led by the governor Lollius Urbicus, was the establishment of a new frontier line across the Forth-­‐‑Clyde isthmus, with a new Wall constructed of turf (SHA Ant. Pius 5.4). This has become known as the Antonine Wall (Fig. 1.3), which will be described in more detail below. Figure 1.3: Map of the Antonine Wall (Courtesy of David Breeze). The Antonine Wall was constructed starting around AD 142, and was occupied for about twenty years. It may have taken about twelve years to complete construction and, by the time the decision to abandon the Wall was made—in AD 158—the process of abandonment may have stretched over more than six years to 164 or later (Breeze 2006a: 167). From this point, Hadrian’s Wall was restored and would continue to function as the primary frontier of Roman Britain until the early fifth century, when the official Roman occupation of Britain came to an end. After the Antonine Wall’s abandonment c. AD 158–64, the Romans returned to Scotland on limited occasions. The best-­‐‑attested period of such activity was during the reign of Septimius Severus (reigned AD 193–211) who—we are told—campaigned in northern Britain, restoring a Wall (probably Hadrian’s), and travelling to the extremity of the island before coming to terms with the enemy (Dio Hist. Rom. 77.11–14). Later the Caledones and Maiatai—tribes of northern Britain, probably located north of the Forth-­‐‑Clyde isthmus (Fraser 2009: 15–20)—revolted and additional battle ensued, during which Severus became ill and died (ibid. p. 15). Shortly after Severus’ death, his son Caracalla made peace with the Caledones, and the Romans appear to have abandoned further attempts to conquer Scotland. By AD 411, Rome had abandoned Britain altogether, though material evidence as far north as Traprain Law demonstrates that contact and trade continued for several centuries (Breeze 2006c: 124). In the early medieval period it was thought that the Walls belonged to a later point in the history of Roman Britain, with the Antonine Wall ascribed to the handiwork of native Britons and construction placed in the late fourth century, shortly before Rome’s final withdrawal (De Excidio 15–18; Hist. Eccles. 1.12). At some time before the late fourteenth century the Antonine Wall would be given a new name, “Grymisdyke” (Chron. Gent. Scot. 3.3), which fits into a growing suite of legends and which aided the development of a mythic landscape in the region. Throughout the post-­‐‑Roman and medieval periods the Wall and its immediate vicinity also saw continued occupation and the construction of new settlements and structures, including medieval villages and several castles. The history and remains of Roman Britain became an important object of study in the early modern period, with the rise of antiquarianism (Keppie 2012). Recently rediscovered classical texts were combined with the evidence of monuments and remains recovered from the landscape to develop understandings of Britain’s development and role during the Roman period. The dominant figure from the late sixteenth until the early eighteenth century was William Camden, whose Britannia (1586) set a model for a wide-­‐‑ranging chorographic approach to Britain’s antiquities that would see many imitations and revisions. Knowledge was further advanced through the works of many additional early modern antiquarians, perhaps none more prominently than the works of the eighteenth-­‐‑century antiquarians and rivals Alexander Gordon (1726) and John Horsley (1732), both of whom provided particularly useful accounts of Roman military remains in northern Britain, and helped to identify many previously unknown sites. Horsley’s work would prove to be very influential through its analytical approach, and is considered to be the most important antiquarian work for studies of the Roman military in Britain (Bidwell 2007: 135). By the late 1800s, antiquarianism was giving way to a more narrowly focused discipline of archaeology, and the study of Roman Britain played an important role in this process (Freeman 2007). For the Antonine Wall itself, the first modern archaeological work was carried out by the Glasgow Archaeological Society (1899) with excavations between the years 1890–93. Following the beginnings of archaeological investigation by the Glasgow Archaeological Society, the early twentieth century saw the publication, in two editions, of Sir George Macdonald’s (1911; 1934b) magisterial account of the Wall’s history and archaeology, which remains to be matched. Since this time, the Wall has been the focus of dozens of excavation and survey projects, with a broad array of publications. In July 2008, the Antonine Wall was inscribed as an UNESCO World Heritage Site, joining Hadrian’s Wall and the German Limes as a component of the broader “Frontiers of the Roman Empire” WHS (UNESCO 2009). 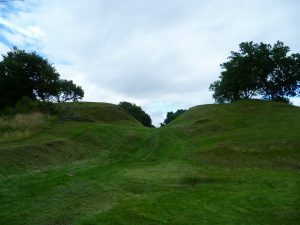 This was the result of long and laborious efforts, both to gain international recognition of the Antonine Wall itself, but also to change the way in which UNESCO conceived of WHS’s in general (for a partial account of this process, see Breeze 2011). points for debate (see Hodgson 2000; 2009c: 11–15; Symonds and Mason 2009: 10–33). There is no evidence that Trajan was personally responsible for this system. Bidwell, P.T. (2007) Roman Forts in Britain. Stroud: Tempus. Birley, E. (1961) Research on Hadrian’ʹs Wall. Kendal: Titus Wilson. Breeze, D.J. (2006a) The Antonine Wall. Edinburgh: Birlinn. Breeze, D.J. (2006b) J. Collingwood Bruce’ʹs Handbook to the Roman Wall, fourteenth edition. Newcastle upon Tyne: Society of Antiquaries of Newcastle upon Tyne. Breeze, D.J. (2006c) Roman Scotland: Frontier Country, new edition. London: Batsford and Historic Scotland. Caes. Gal. Julius Caesar, De Bello Gallico. (Edwards 1917). Creighton, J. (2000) Coins and Power in Late Iron Age Britain. New Studies in Archaeology. Cambridge: Cambridge University Press. Flavian fort, 1990. Britannia, 22: 45–109. Cariama. I.D. (1997) Maryport and the Flavian conquest of north Britain, pp. 40–52 in R. J. A. Wilson (ed.) Roman Maryport and its Setting: Essays in Memory of Michael G.
Jarrett. Kendal: Cumberland and Westmorland Antiquarian and Archaeological Society. Chron. Gent. Scot. John of Fordun, Chronica Gentis Scotorum. (Skene 1872). Darvill, T. (1987) Prehistoric Britain. London and New York: Routledge. De Excidio Gildas, De Excidio et Conquestu Britanniae. (Mommsen 1898). Dio Hist. Rom. Cassius Dio, Historia Romana. (Cary 1914–27). Freeman, P.W.M. (2007) The Best Training-­‐‑Ground for Archaeologists: Francis Haverfield and the Invention of Romano-­‐‑British Archaeology. Oxford: Oxbow Books. Hanson, W.S. and Breeze, D.J. (1991) The Future of Roman Scotland, pp. 57–90 in W.
Hanson, W.S. and Maxwell, G.S. (1983) Rome’s North West Frontier: The Antonine Wall. Edinburgh: Edinburgh University Press. Hist. Eccles. Bede, Historia ecclesiastica gentis Anglorum. (Colgrave and Mynors 1969). Jones, R.H. (2011) Roman Camps in Scotland. Edinburgh: Society of Antiquaries of Scotland. Jones, S. (1997) The Archaeology of Ethnicity: Constructing Identities in the Past and Present. London: Routledge. Millett, M. (1990) The Romanization of Britain: An Essay in Archaeological Interpretation. SHA Scriptores Historiae Augustae, or Historia Augusta. (Magie 1921). Tayside and Fife Archaeological Committee. Framework for Hadrian’ʹs Wall, vol(s). 1–2. Durham: Durham County Council. Tac. Agr. Tacitus, Agricola. (Ogilvie and Richmond 1967). UNESCO (2009) Decisions Adopted at the 32nd Session of the World Heritage Committee (Quebec City, 2008), WHC-­‐‑08/32.COM/24Rev. Paris: UNESCO World Heritage Centre. http://whc.unesco.org/en/sessions/32COM (accessed 18 July 2012). Wooliscroft, D.J. (2009) 79 AD and All That: When Did the Romans Reach Perthshire?, pp. 33–38 in D. J. Breeze, L. M. Thoms & D. W. Hall (eds.) First Contact: Rome and Northern Britain. Perth: Tayside and Fife Archaeological Committee. of Northern Scotland. Stroud: Tempus. PhD Thesis originally published by Durham University under the terms of a Creative Commons Attribution-NonCommercial-NoDerivs 3.0 Unported license. This entry was posted in Ancient, England, History, Roman, Rome. Bookmark the permalink.